4 x 4 x 2" 4 x 4 x 4" 6 x 4.5 x 4.5" 6 x 6 x 4" 6 x 6 x 6" 8 x 8 x 3.5" 9 x 4.5 x 4.5" 10 x 10 x 6" 12 x 6 x 6" 12 x 12 x 2.5" 12 x 12 x 5.5"
Make packaging your product easy and beautiful! 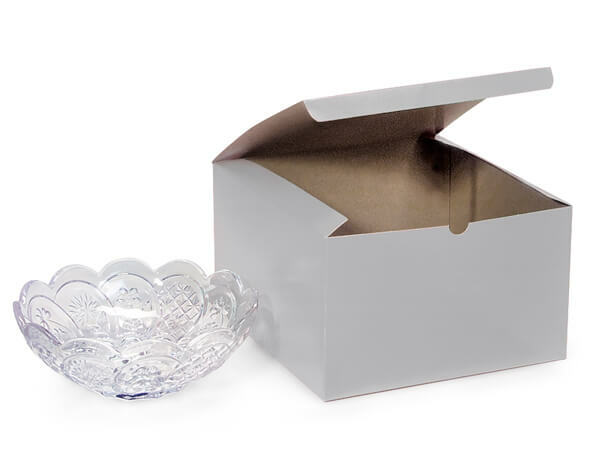 Our 1-piece and 2-piece high gloss gift boxes fold flat for easy storage. Boxes are tinted white board with gloss coating and have a claycoat interior. Boxes are made in the USA and 100% recycled. A wide range of sizes are available for larger items. Great for gifts, apparel and much more! Use a food safe barrier like food grade tissue or cello for food packaging as these boxes are not FDA approved.